Make: High-Power Rockets - New Book on HPR Is Now Out! After a long wait, we now have a new book on rocketry by author Mike Westerfield. He wrote a book I often talk about here on the blog, Make: Rockets: Down-to-Earth Rocket Science about low power model rocketry. If you haven't read it, I do highly recommend it. The new book has been in the works for some time, and when we had Mike on The Rocketry Show podcast a while back, it was still in development. It's called Make: High-Power Rockets, and it came out last week. The book is compact but full of great information. Because it's by Maker Media, it focuses on building your own projects, rather than working with kits. This is exactly the approach taken with the previous Make: Rockets book, and I for one found it so helpful. After reading The Handbook of Model Rocketry, which gave me a great understanding of the principles of rocketry, I still felt I would forever be a rocketeer who merely built kits. Scratch building, I assumed, was for people who had all kinds of skills - and tools - that I didn't have access to. Make: Rockets takes you through a series of projects, building designs by the author, just from parts. Once you've built a few model rockets, then see how easy it is to cut parts to size and come up with your own design, scratch building becomes pretty easy. Sure, you may still not know how to design and make your own nose cones or body tubes, but you can come up with some interesting designs of your own using commercially available parts. After reading it, I designed and flew my very first scratch build - a two-stager which flew beautifully. Make: High-Power Rockets is great in that same way. It starts off with the basics of getting a Level 1 high power rocketry certification - which you must have in order to purchase and fly H or I rocket motors. But instead of suggesting this or that kit - the "perfect kit for an L1" - the author takes you through the steps of building an original design of his, called Callisto. My rendering of Callisto, a good L1 rocket you can build from scratch. The really terrific part of building Callisto is that in putting together your plan to build it, the author takes you step by step through creating a simulation in OpenRocket from scratch. This is a great way to learn how to build a design in a rocket simulator - especially since they don't come with instructions! Callisto is a great-looking but simple 2.6 inch diameter rocket which flies on 29mm motors, meaning it can be flown as a mid power rocket if you either don't have a certification or wish to fly without a waiver from the FAA. It's simple to construct and is mostly made of LOC Precision parts, available online. Make: High-Power Rockets takes you from Level 1 certification all the way through Level 3, which allows you to fly M motors and above. The book is very clearly written, and since it's for beginning makers, it is full of color photographs and detail. While it doesn't cover every aspect of HPR (for instance, it doesn't go into detail on more difficult areas of HPR, like clustered or multistage rockets), it covers important basics most HPR fliers will want to know about, such as dual deployment, assembling motor reloads, working with materials such as fiberglass and what Public Missiles Limited refers to as "quantum tubing," and of course safety and how to pass the Level 2 and Level 3 written exams. And the Level 2 and 3 projects are capable of high altitudes and Mach-busting flights. Make: High-Power Rockets is a great, clearly written, beautifully photographed edition to the rather small library of hobby rocketry books. 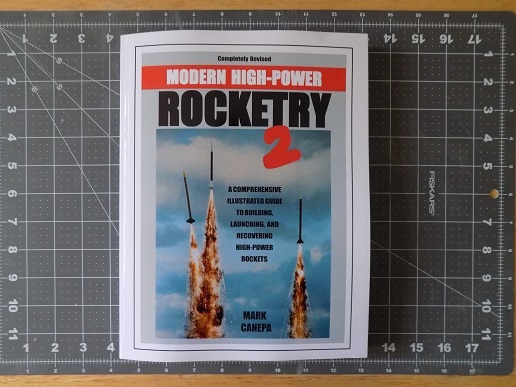 Since the previous book on HPR - Modern High Power Rocketry 2 by Mark Canepa - is nearly 13 years old, it's good to have an update and a second author's point of view on the subject. Keep an eye out - we'll be talking with Mike Westerfield on The Rocketry Show podcast in a future episode, and we may have some free copies of the book to give away! We'll iron out the details of that shortly.